Welcome to the Fit Small Business Xero training course! 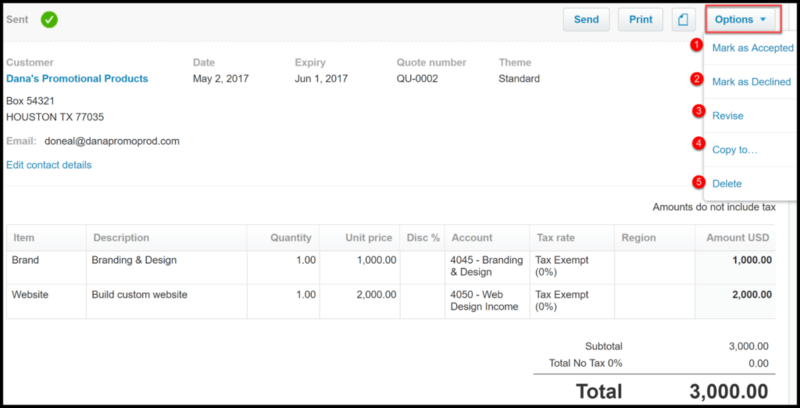 In this lesson, we’re going to cover how to create an online sales quote, bid or estimate in Xero. Why Is It Important to Create a Sales Quote, Bid or Estimate? As a business owner, you may need to provide your customers with a quote for products and/or services that they are considering purchasing from you. Creating a quote in Xero will allow you to easily keep track of the status, and with just a few clicks, create an invoice, bill or purchase order from a quote. While Xero uses the term “quote” by default, you can change this to “bid” or “estimate,” depending on your preference. In this lesson, we will walk through the steps of how to create an online quote, how to create invoices, purchase orders and bills from quotes and how to make changes or delete a quote altogether. How Do I Create an Online Quote/Bid/Estimate? 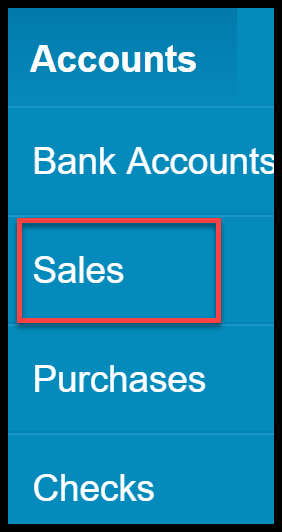 Step 1 – From the Xero Dashboard, click on Accounts and select Sales as indicated in the screenshot below. Step 2 – Click the New button and select Quote from the dropdown as indicated below. Step 3 – Below is a screenshot with all of the fields that need to be completed along with a brief description of each one. Customer – From the dropdown, select the customer that you want to create the quote for. If you have not set up the customer yet, you can do so by typing the customer’s name and then selecting new contact. Watch our video tutorial to learn How to Setup Customer Contacts. Date – This field will automatically populate with today’s date; you can change the date if you need to. Expiry – This field will automatically populate with the default date that you set up for quotes. If the expiration date differs from the default, you can change it here. Watch our video tutorial to learn How to Setup Default Dates for Quotes. 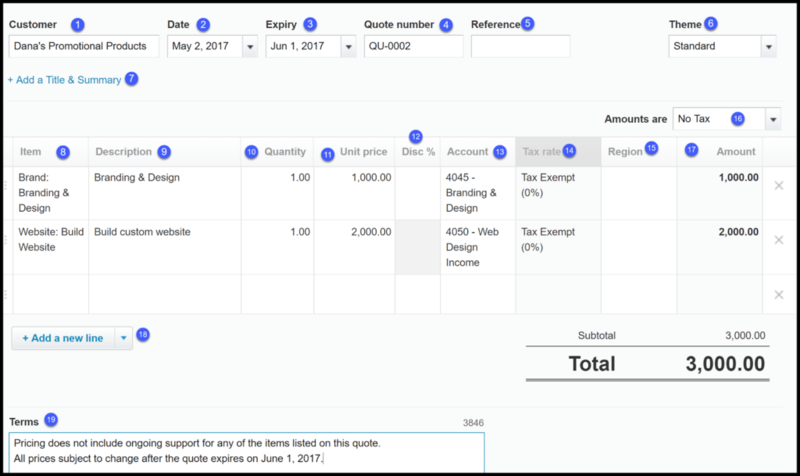 Quote number – This field will automatically populate with the next available quote # to ensure that duplicate quotes are not created. Reference – Enter any additional info that you would like in this reference field. Theme – The branding theme that you selected during the invoice setup will automatically populate in this field. Click the dropdown to change it. Item – From the dropdown, select the item that you are providing a quote for. If you have not set up the product/service in Xero, you can do so here by clicking Add Item. Be sure to watch our How to Setup Products and Services tutorial to learn how to setup and manage inventory items. Description – This field will auto-populate based on the item selected above. However, you can modify the description if you need to. Quantity – Enter the quantity for each item. For services, enter a quantity of 1. Unit price – This field will auto-populate based on the unit price set up for the item. If the item is set up with a unit price of zero, you will need to enter it in this field. Discount – If applicable, enter the discount you would like to apply to the quote. If you would like to set certain customers up with a standard discount, you can do so in invoice set up. Account – From the dropdown, select the account that you would like to use to track income for each item sold. Watch our How to Setup Accounts tutorial to learn more about the chart of accounts. Tax Rate – In the How to Setup Sales Tax Rate Lesson, we show you how to setup a default tax rate that is applicable to most of the products and services that you sell. If you did not set up a default tax rate, click the dropdown to select the appropriate tax rate for each item. Tracking category (Region) – Xero allows you to set up tracking categories to see how different areas of your business are performing (i.e. departments, locations or regions). From the dropdown menu, you can assign a default tracking category for quotes; in the screenshot above region has been set up as a tracking category. Amounts are – From the dropdown, select whether the amounts should include no tax, tax exclusive or tax inclusive. To learn more about tax amounts, check out our organization and financial tutorial. Amount – Xero will multiply the quantity column by the unit price column to automatically calculate the amount field. Add Additional Lines – If necessary, you can add additional lines to the quote. Terms – Indicate the terms of the quote in this field. You can set this info up to automatically appear on each quote. 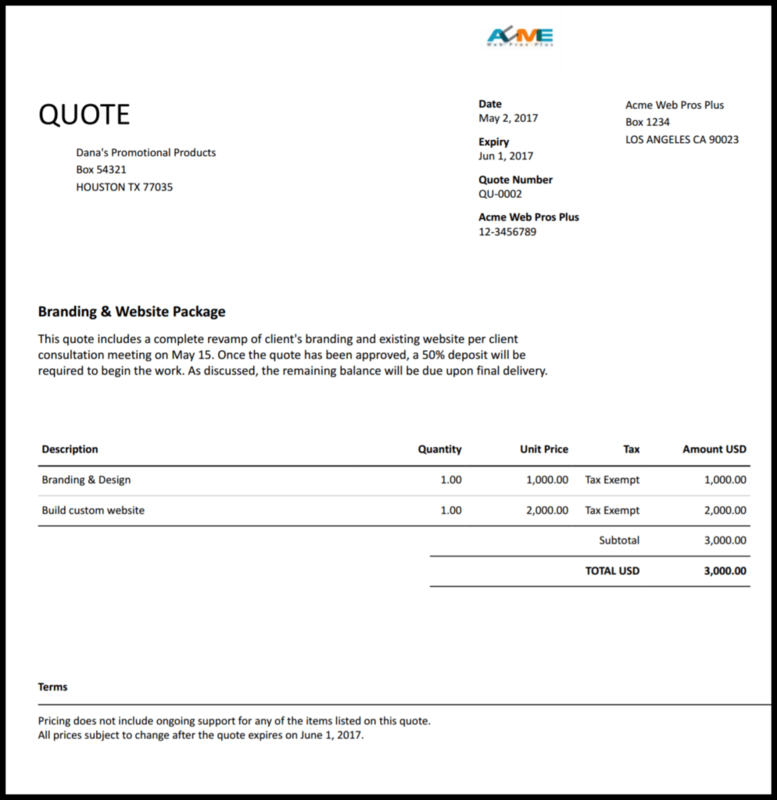 Check out our invoice setup lesson to learn how to set up default terms for all quotes. Step 4 – Once you have completed all of the fields, you can click the “Save” or “Send” button. Below is a screenshot along with the various save options you can choose from. Save as draft – This option will save your quote and allow you to close out of this screen. 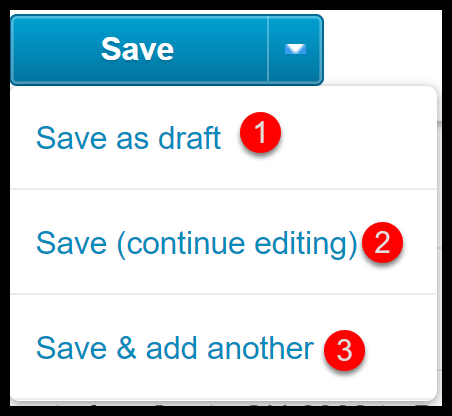 Save (continue editing) – This option will allow you to save your quote before you are done with the quote. You can save periodically so that you don’t lose any info. 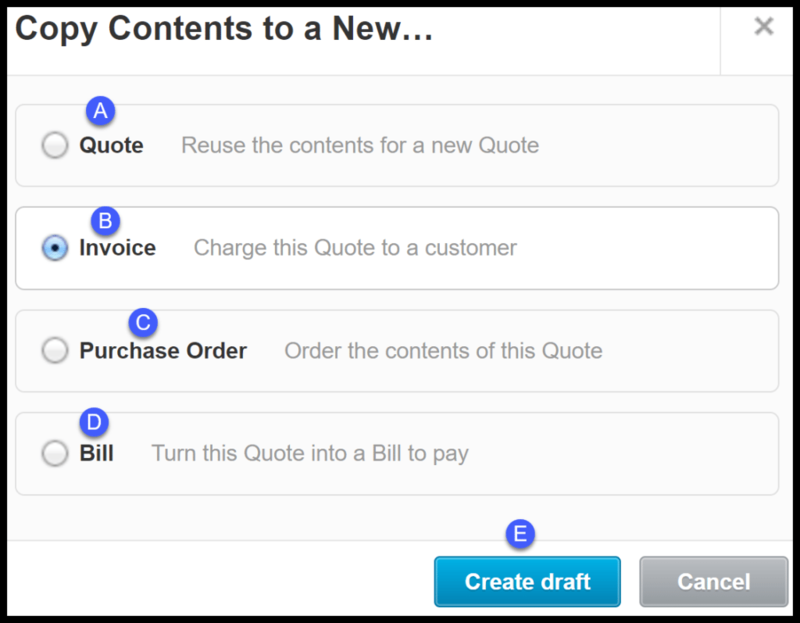 Save & add another – This option will save your quote as a draft and open up a new blank quote for you to complete. Email Quotes to Customers from Xero. To: This field will automatically populate with the email address that was set up for the customer. If you would like to send the quote to more than one person, just type the email address for each person and put a semicolon (;) in between each email address. Subject Line: Xero will automatically populate this field. However, you can modify it as you see fit. Body of Email: This is the standard messaging that will be sent to your customer. Note: Notice that there will be a link for your customer to click on to view the quote online. Once they view the online quote, they can also accept, decline or send you a question/comment and print the quote if needed. CC: Select this box if you would like to receive a copy of the email that goes out to your customer. Click the “Send” button once you are satisfied with the email. Step 1 – Return back to Quotes by selecting Accounts and then Sales as indicated below. Step 2 – Scroll down until you get the quotes section as indicated in the screenshot below. Draft – These are quotes that you have created but have not sent to customers yet. 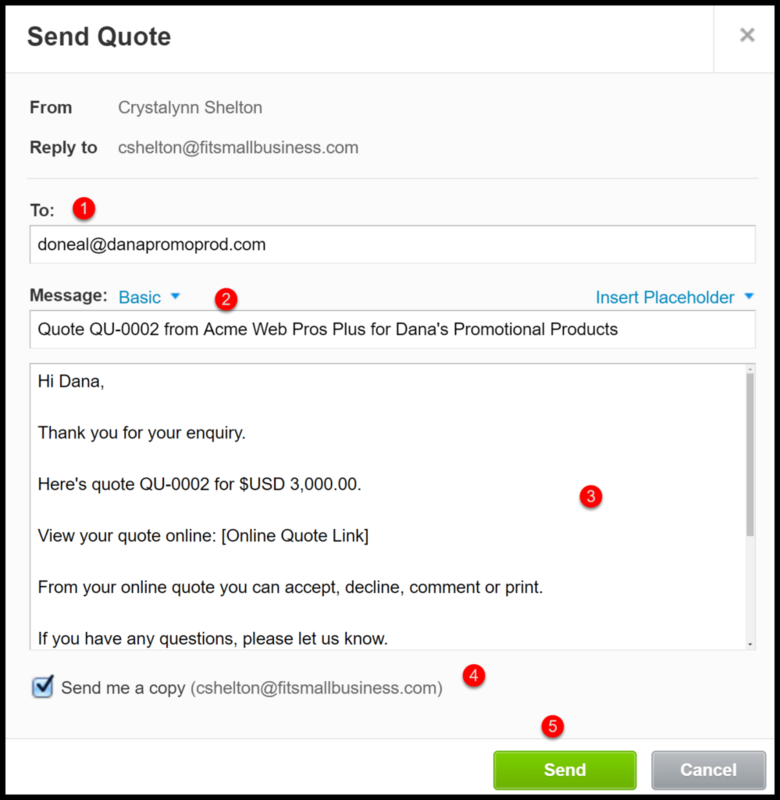 Sent – Quotes that you have sent to customers will appear in this group. Accepted – Quotes that have been approved by your customers will fall into this category. Expired – Quotes that have reached their expiration date will fall into this group. Step 3 – Click on the group that your quote falls into and the following screen will display as indicated in the screenshot below. Step 4 – Your quote should display on the screen. Select the “Options” button as indicated in the screenshot below. There are five modifications available in this screen. Below is a brief description of what each one does and when you might use it. Mark as Accepted – If you don’t send quotes via email to your customers but instead you mail or fax them, once your customer approves the quote, you will need to manually mark the quote as accepted in this screen to update the status. Mark as Declined – By the same token, if you mail or fax a customer a quote and they decline it; you will need to manually mark the quote as declined in this screen to update the status. Revise – If you just need to make some changes to the quote based on your customer’s request, you can easily revise a quote by clicking this button and making the necessary changes. Copy to – To save time, Xero will take the contents of an existing quote and create a new quote, an invoice, purchase order or bill using the same info. Below is a screenshot of the copy contents screen along with a brief explanation of each. Delete – If you want to delete a quote, you can easily do that by selecting this option. Since quotes are considered a non-financial transaction, deleting a quote will have no impact on your financial statements. Quote – If you need to send a quote for the same products and services to another customer, select this option and Xero will copy this info to a new quote. From there, you can make any changes to the customer and any other info as you see fit. Invoice – Once your customer has accepted a quote, select this option and Xero will copy all of this info over to an invoice so that you can bill your customer. Purchase Order – If you realize that you need to place an order for products that you have on an existing quote, select this option to copy that info over to a purchase order so that you can promptly place an order to your supplier. 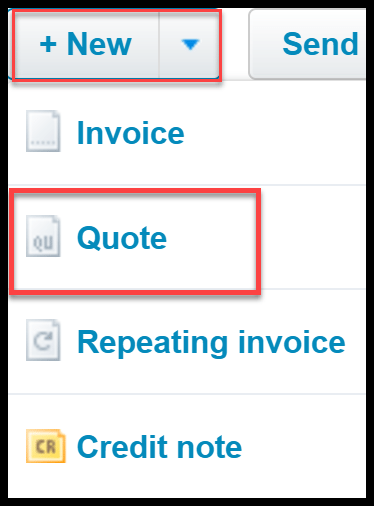 Bill – You can create a bill in Xero by copying items from an existing quote to a bill that you need to pay. “Create draft” – Once you have made your selection, click this button to copy the info from the quote to the document that you have selected. That wraps up the section on how to create online sales quote, bid or estimate. The next lesson in our Xero Training Course will be how to invoice a customer. In this lesson, we will walk you through how to create invoices to bill customers for the products and services they have purchased from you. To access this lesson or any of the others in the series, click here. For a free 30-day trial of Xero, click the button below.